Spam King’s Wife: Peter, tomorrow is beach day with grand-kids. Go try on swimsuit I bought you on our honeymoon. Spam King’s Wife:Peter! You look 8 months pregnant! Dostatochno! [Enough] You have to lose weight. Summer is almost here. Get out and walk or bike or something! Spam King: Solnishka, when do I have time to walk or bike? I work all the time! You like spending my money? I have to work! 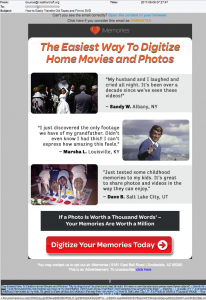 Spam King’s Wife: You HAVE to do something! You look like fat pig! Then go take pill and lose 30 pounds! Spam King: Take pill? Take pill… Solnishka, my love! What a great idea! This will be our new campaign! Everyone looks in mirror this time of year and think “I need to lose weight.” This is our new campaign!! And so it is…. 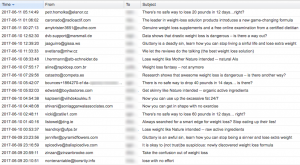 For several weeks, we’ve seen a constant heavy stream of malicious spam focused on losing weight. 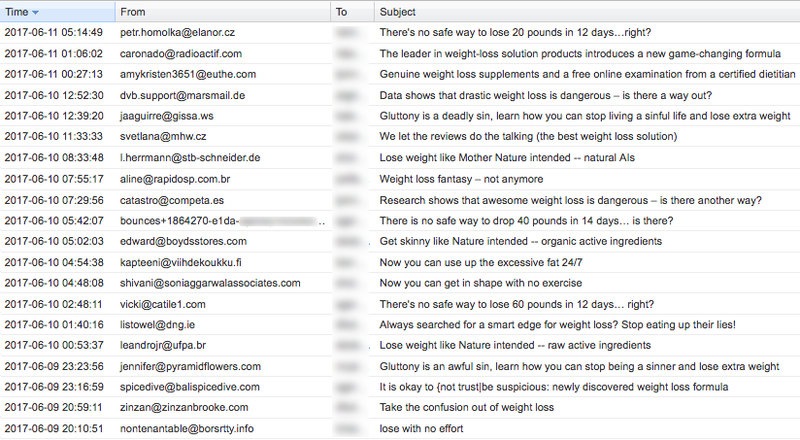 From diet plans to special pills, these promises of melting away fat are lies and social engineering tricks. Here is a very short list of just such ridiculous emails. You’ll love the subject lines! Important note: Though we joke about a “Spam King,” it is no joke. There are such individuals and one Russian Spam King was recently arrested and his botnet taken down thanks, in part, to the FBI. (Are you listening Trump?) Read how the FBI helped take down Peter Yuryevich Levashov in the article at Wired.com. How to restore Any “Battery” on your Own! 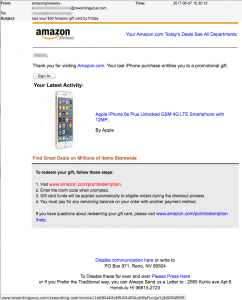 Would you think this next email is really from Amazon about an iPhone promotional gift? “Use your $50 Amazon gift card by Friday” is the subject line, but this is smelly phish for sure! “Thank you for visiting Amazon.com. Your last iPhone purchase entitles you to a promotional gift” SIGN IN. 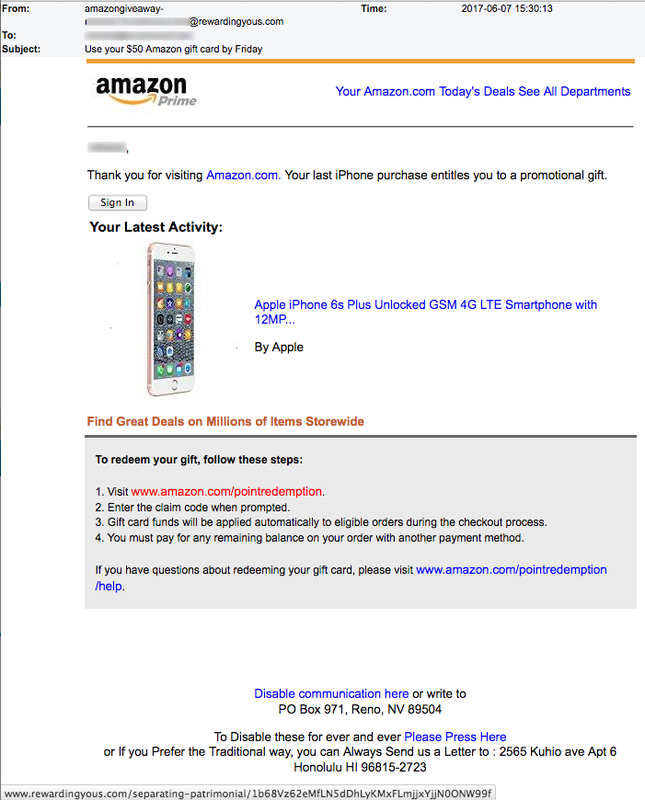 But a mouse-over of SIGN IN and the other Amazon links show that they point to the domain rewardingyous-DOT-com. You think you’re logging into Amazon? Think again. This oddball domain, sounding like a 1950’s Brooklynite addressing a group of people, was registered on June 7, the day the email was sent. 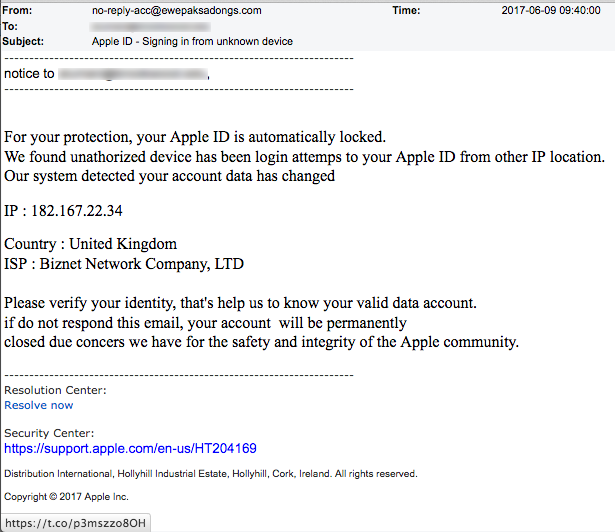 This phish is easy to spot if you pay attention to the from address and mouse-over the link “resolve now.” “For your protection, your Apple ID is automatically locked.” Horse manure! Don’t be fooled by seeing the secure link (httpS) in the mouse-over. 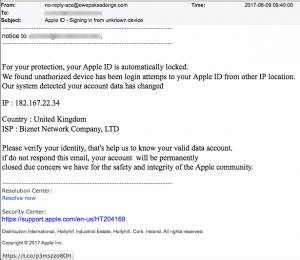 That’s just a secure shortening service used by the criminals who crafted this phish. We unshortened it using Urlex.org The link points to apple-id.case-accounts-DOT-com. 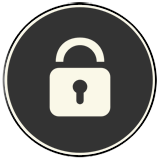 In this link “apple-id” is a sub-domain. Sub-domains can say anything one wants. Focus on what appears immediately in front of “.com” separated by a period from the sub-domain and you’ll see case-accounts. This domain was registered on June 9 using a privacy proxy service in Ontario, Canada. 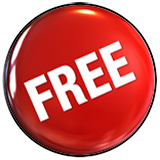 “ATTENTION you have been selected for a Free Sample Offer!” says an email sent from Peru (.pe = country code for Peru). The sender goes on to say that it was a friend of yours who anonymously sent the email. Right, and we have land to sell you in Atlantis. The link for “Follow the URL to read more information…” points to a hacked website for a clothing store in Peru that specializes in “Amahra Wool. We would love to take an African safari! We’ve talked about it for years. But this isn’t the way to go about it. 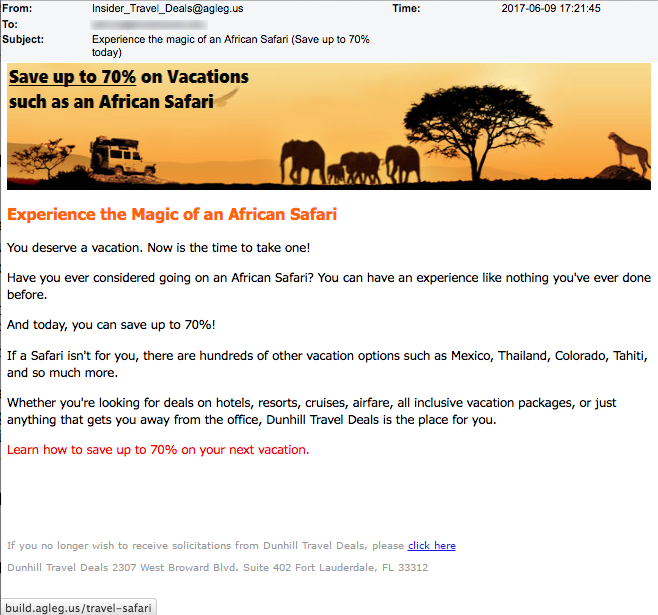 The email came from Insider_Travel_Deals @ agleg.us with the subject line “Experience the magic of an African Safari (Save up to 70% today)” Notice the urgency to engineer your clicking behavior. Google can’t find any website at agleg.us and that’s because the domain was registered the day this email was sent by a “Bary Mifflin” from Trondheim, Norway. The site is hosted in England. Does any of this sound like Dunhill Travel Deals in Fort Lauderdale, Florida, whom they claim to represent? 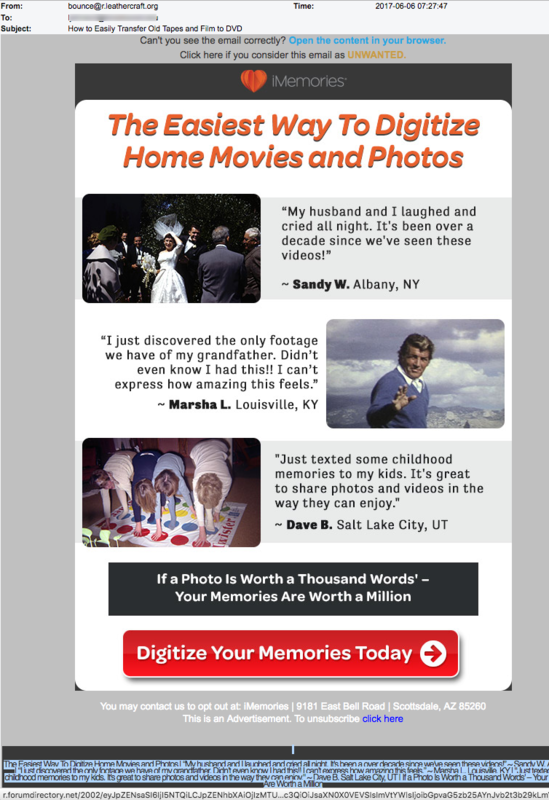 We’ve seen these bogus emails before that pretend to represent the website iMemories.com in Scottsdale, Arizona. But all the links in this scam email point to a sub-domain on the website forumdirectory.net, a website registered to a man from Bucharest, Romania. However, we absolutely loved that photo of Dean Martin! 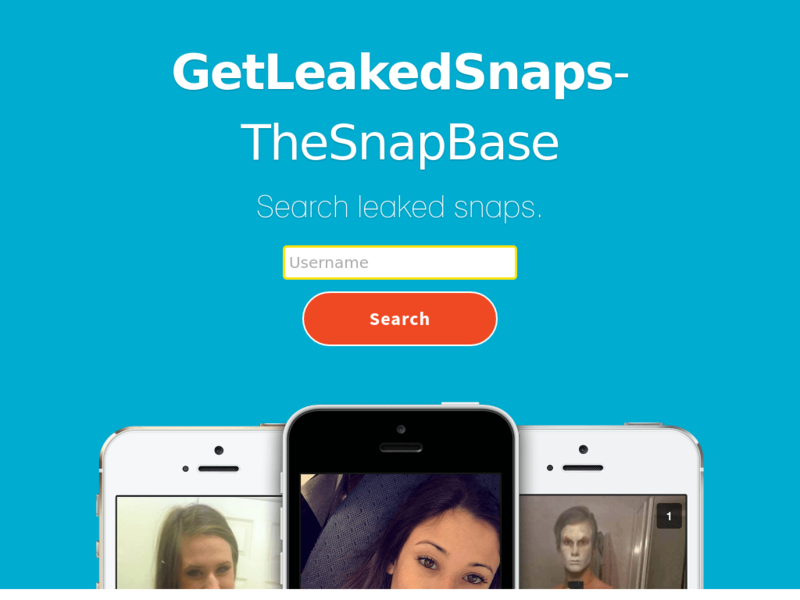 TOP STORY: Get Leaked Snaps – Sketchy at Best! “Online privacy” is an oxymoron. 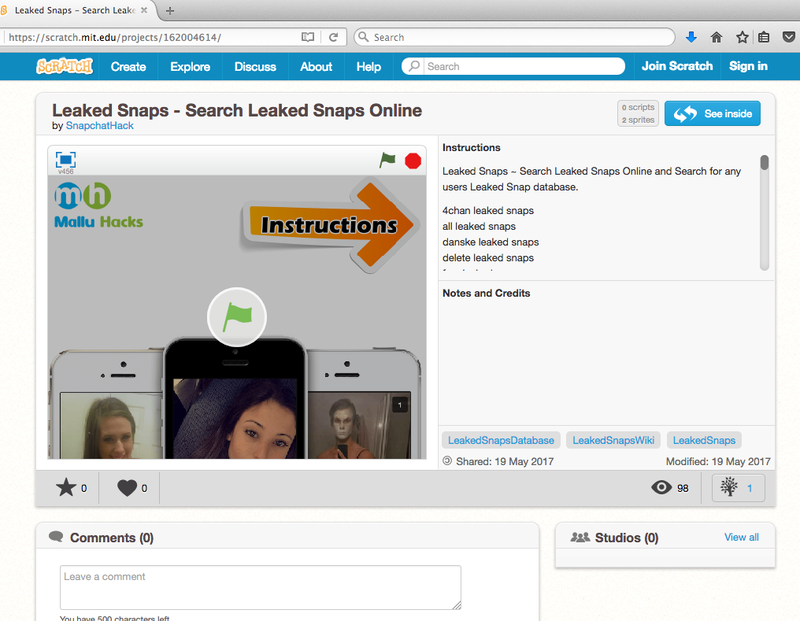 Tens of thousands of Snaps have been hacked and exposed from Snapchat servers. They were made available on the Internet. 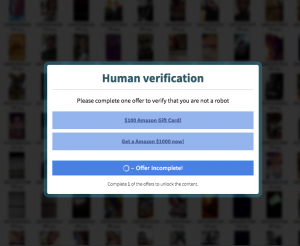 As of this month, there are at least 7 apps that automatically capture snaps the moment they are opened on a smartphone, and without informing the sender. 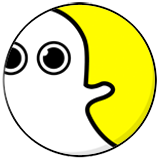 And all those “deleted” snaps are still sitting on user’s smartphones and are simply disguised and hidden from view. But we digress…. The more we dig into this story, the worse it feels. Our assessment is clear…. 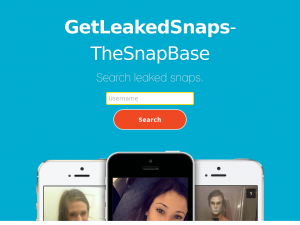 TDS DOES NOT recommend using these websites that claim to give access to stolen/leaked Snapchat snaps! Imagine getting a notice from “accounting@YOURDOMAIN” with the message “accounting@YOURDOMAIN has sent you a document through Google Docs” and the button to View Document. We moused-over that button to see that it points to the hacked website pamthelandgal-DOT-com, not Google. A search of this hacked domain turns up a link to an analysis about malware on Malware-Traffic-Analysis.net. This can’t be good, people. Getting an email from a DOT-edu carries some legitimacy. It came from a college or university (or other educational institution that was grandfather’d into the ICANN rules that were established in 1998) This seemingly legitimate nature of .edu is why criminals often like to send malicious emails from this top-level domain. Here are two such examples…. This first is an email that appears to come from a copier at an educational institution and targeting people at that same institution. However, the attached zip file contains malware. This next one is just another plain vanilla Nigerian 419 scam. And it came to us in the simplest of emails. We’ve attached the entire letter as a pdf for your reading pleasure.